Yoga movements, such as forward bending poses increase blood and oxygen supply to the face and head, thereby stimulating the nerves of the scalp. These poses also help reduce stress by switching from sympathetic to parasympathetic nervous system. Some other yoga poses help relieve tension and anxiety from the body and improve digestion, which ensures the nutrients are well absorbed and carried to support our health. 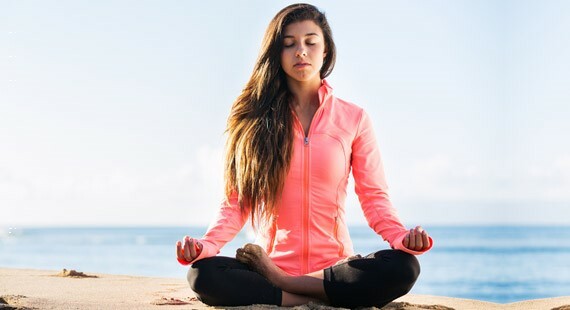 Breathing exercises help to oxygenate the body and scalp, which also helps in maintain a healthy hair, while some hand poses –like those including the rubbing of the nails– help revitalize hair follicles connected to the nails. The reason why there is improvement when practicing the rubbing methods is because the nerves under the nail have direct connection to the nerves in the scalp, thus the generated friction by the nails help in stimulating flow of blood and oxygen to the scalp. 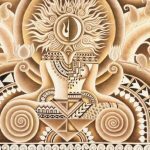 When practiced for a sufficient time, these yoga and Pranayama techniques can promote hair growth and strength. This one of the best yoga poses for hair growth, which promotes blood circulation in the head and the crown region which in turn nourishes the hair follicles. Start on your hands and feet with your knees and hands touching the ground and hands kept perpendicular to the knees and shoulders. Now straighten your legs by pushing the hips out and stand on your toes. Push the floor with your palms and straighten your spine. Now, pull your hips down slowly and come back to the starting position. It promotes blood supply to the head and aids in preventing hair fall and to improve the quality, thickness and texture of hair. Stand with your legs close. Take a deep breath, lift up your hands while you exhale and then bend forward and touch the floor with your hands. Stay in this forward bending position for a few seconds while breathing normally and then stand back straight while taking a deep breath. When you perform this asana, blood circulation in the scalp increases, and it enables the hair follicles to grow. Kneel down on the floor with your spine kept straight and heels together. Put your hands on your thighs, palms facing down. Relax and take deep breaths for 1 minute and then stretch your legs forward. This is one of the most functional yoga poses to prevent hair loss, which purifies the body and flushes out toxins from the system. It purifies the blood and improves the growth of hair by stimulating the hair follicles. Lie on your back and pull your knees in towards your chest while exhaling. Move your legs up with the strength of your thighs rather than your arms to pull them up, hold this position for a few seconds. Now, inhale and let your legs move away from your chest. Let your breath direct your movement. Kneel down on the floor with your hips resting on your heels. Now, bend forward and touch the crown of your head on the floor and hold your heels with your hands. Hold this position for 5 breaths and come back to the starting position. You will just need to rub the fingernails of both hands together. 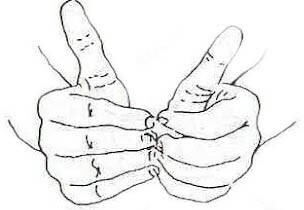 Curl your fingers inwards so that the point towards your palm. Now, bring your hands together so that the nails of all the fingers are in contact with each other. Make sure each nail touches the corresponding nail in the other hand. Rub them vigorously for 5 minutes. Don’t use the thumbnails for this exercise. This pose helps the brain receive more oxygen so that it promotes the functions of the nervous system and removes toxins from the body. Sit in Padmasana or Lotus Pose with your legs folded. Now, throw out your breath forcefully and breathe in softly. Repeat this breathing technique for 5 minutes non-stop. This is another pranayama that helps remove excess bile, phlegm and wind from the body. It also purifies the blood and the nervous system. This in turn helps promote hair growth. This is a forceful breathing exercise in which you sit in Vajrasana position and clench your fists and bring them beside your shoulder. Now forcefully breathe in as you push your hands upwards and breathe out as you lower them down. It is a simple, alternate breathing technique that helps to keep the lungs healthy and fight the free radicals produced due to stress. It promotes proper circulation throughout the body and helps relieve cold and promotes the growth of healthy hair by nourishing the scalp. Sit in the Padmasana or Lotus Pose and place the thumb of one hand on one nostril and fold the index finger. Keep the ring finger straight so that it can be used to close the other nostril. Now, inhale deeply through the open nostril, close it with the index finger, open the other nostril and exhale through it. This makes 1 cycle. To begin the next cycle inhale through the same nostril that you exhaled out of and repeat the breathing process. Your hair health is the reflection of your inner health, so not only what you put onto your body is important, but also what you put into it. The best way to get your nutrients into your system is by eating whole foods and to stay away from processed foods, since these contain chemicals that our bodies don’t recognize and end up damaging our metabolism. This applies to cosmetics, lotions, hair products and lotions. Since our skin is transdermal, meaning that it absorbs anything that is put onto it, putting on it only 100% natural products to clean it, like the Morrocco Method Feng Shea Scrub, will give your skin the oils and moisture it needs without exposing yourself to toxic side effects. What is the hair breathing technique? How/ when do you use it?